Red dwarfs constitute the majority of all stars. According to the Hertzsprung-Russell diagram, a red dwarf star is a small and relatively cool star of the main sequence, either late K or M spectral type. Red dwarfs constitute the vast majority of stars and have a mass of less than one-half that of the Sun (down to about 0.075 solar masses, which are brown dwarfs) and a surface temperature of less than 3,500 K. They have enormous estimated lifespans, ranging from tens of billions up to trillions of years. 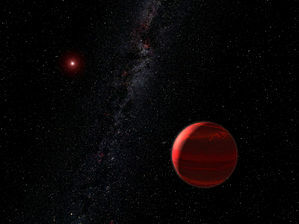 An artist's impression of a planet in orbit around a red dwarf. Red dwarfs are stars with very low mass, generally no more than 40 percent of the mass of the Sun. Consequently, they have relatively low temperatures in their cores and energy is generated at a slow rate through nuclear fusion of hydrogen into helium via the proton-proton (PP) chain mechanism. Thus these stars emit little light, sometimes as little as 1/10,000th that of the Sun. But even the largest red dwarf has only about ten percent of the Sun's luminosity. 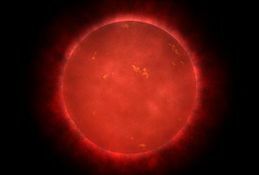 In general, red dwarfs transport energy from the core of the star to its surface by convection. Convection occurs because of opacity of the interior, which has a relatively high density compared to what one would expect at that temperature. As a result, it is more difficult for photons to travel toward the surface by radiative processes. Convection takes over energy transport because it is a more efficient process. As red dwarfs are fully convective, helium does not accumulate at the core and, compared to larger stars such as the Sun, they can burn a larger proportion of their hydrogen before leaving the main sequence. Thus, red dwarfs have an enormous estimated lifespan: from tens of billions up to trillions of years, depending upon their mass. These lifespans are longer than the estimated age of the universe. The lower the mass of a red dwarf, the longer its lifespan. As the proportion of hydrogen in a red dwarf is consumed, the rate of fusion declines and the core starts to contract. The gravitational energy generated by this size reduction is converted into heat, which is carried throughout the star by convection. The fact that red dwarfs and other low mass stars remain on the main sequence while more massive stars have moved off the main sequence allows the age of star clusters to be estimated by finding the mass at which the stars turn off the main sequence. This provides a lower, stellar, age limit to the Universe and also allows formation timescales to be placed upon the structures within the Milky Way galaxy, namely the Galactic halo and Galactic disk. One mystery which has not been solved as of 2007 is the absence of red dwarf stars with no "metals." (In astronomy, a "metal" is any element other than hydrogen or helium.) The Big Bang model predicts the first generation of stars should have only hydrogen, helium, and trace amounts of lithium. If such stars included red dwarfs, they should still be observable today, but as yet none have been identified. The preferred explanation is that without heavy elements only large and as yet unobserved population III stars can form, and these rapidly burn out leaving heavy elements, which then allow for the formation of red dwarfs. Alternative explanations, such as that zero-metal red dwarfs are dim and could be few in number, are considered much less likely, as they seem to conflict with stellar evolution models. Red dwarfs are the most common star type in the galaxy, at least in the neighborhood of the Sun. Proxima Centauri, the nearest star to the Sun, is a red dwarf (Type M5, apparent magnitude 11.05), as are twenty of the next thirty nearest. However, due to their low luminosity, individual red dwarfs cannot easily be observed over the vast interstellar distances that luminous stars can. Extrasolar planets were discovered orbiting the red dwarf Gliese 581 in 2005, about the mass of Neptune, or seventeen earth masses. It orbits just six million kilometers (0.04 AU) from its star, and so is estimated to have a surface temperature of 150 °C, despite the dimness of the star. In 2006, an even smaller extrasolar planet (only 5.5 times the mass of Earth) was found orbiting the red dwarf OGLE-2005-BLG-390L; it lies 390 million km (2.6 AU) from the star and its surface temperature is −220 °C (56 K). In 2007, a new, potentially habitable extrasolar planet, Gliese 581 c, was found, orbiting Gliese 581. If the mass estimated by its discoverers (a team led by Stephane Udry), namely 5.03 times that of the Earth, is correct, it is the smallest extrasolar planet revolving around a normal star discovered to date. (There are smaller planets known around a neutron star, named PSR B1257+12.) The discoverers estimate its radius to be 1.5 times that of the Earth. This planet is within the habitable zone of Gliese 581, and is the most likely candidate for habitability of any extrasolar planet discovered so far. Planetary habitability of red dwarf star systems is subject to some debate. In spite of their great numbers and long lifespans, there are several factors that may make life difficult on planets around a red dwarf star. First, planets in the habitable zone of a red dwarf would be so close to the parent star that they would likely be tidally locked. This would mean that one side would be in perpetual daylight and the other in eternal night. This situation could create enormous temperature variations from one side of the planet to the other. Such conditions would appear to make it difficult for life (as we know it) to evolve. On the other hand, recent theories propose that either a thick atmosphere or planetary ocean could potentially circulate heat around such a planet. Another potential problem is that red dwarfs emit most of their radiation as infrared light, while on Earth plants use energy mostly in the visible spectrum. But perhaps the most serious problem may be stellar variability. Red dwarfs are often covered in starspots, reducing stellar output by as much as 40 percent for months at a time. At other times, some red dwarfs, called flare stars, can emit gigantic flares, doubling their brightness in minutes. This variability may also make it difficult for life as we know it to survive near a red dwarf star. ↑ The Hertzsprung-Russell diagram shows the relationship between absolute magnitude, luminosity, classification, and effective temperature of stars. The diagram was created circa 1910 by Ejnar Hertzsprung and Henry Norris Russell. ↑ 2.0 2.1 Michael Richmond, (November 10, 2004) "Late stages of evolution for low-mass stars" Rochester Institute of Technology. Retrieved November 28, 2007. ↑ G. Chabrier, I. Baraffe, and B. Plez, 1996 "Mass-Luminosity Relationship and Lithium Depletion for Very Low Mass Stars" Astrophysical Journal Letters 459: L91-L94. Retrieved November 28, 2007. ↑ Thanu Padmanabhan, Theoretical Astrophysics (Cambridge University Press, 2001, ISBN 0521562414), 96-99. ↑ Theo Koupelis, In Quest of the Universe (Jones & Bartlett Publishers, 2007, ISBN 0763743879). ↑ Ker Than, "Major Discovery: New Planet Could Harbor Water and Life", Space.com. Retrieved November 28, 2007. Britt, Robert Roy. "Neptune-Size Planet Orbiting Common Star Hints at Many More" Space.com. Retrieved November 28, 2007. Burrows, A., W. B. Hubbard, D. Saumon, and J. I. Lunine. 1993. "An expanded set of brown dwarf and very low mass star models" Astrophysical Journal 406 (1): 158-171. Retrieved November 28, 2007. "VLT Interferometer Measures the Size of Proxima Centauri and Other Nearby Stars", European Southern Observatory, November 19, 2002. Retrieved November 28, 2007. This page was last modified on 6 July 2015, at 22:53.